I recently stumbled upon some articles on color vision impairment and was surprised to discover that it affects about 8% of adult men. It’s not that they are colorblind, but rather they distinguish hue, saturation and brightness differently than the rest of the population. The particular paper that I liked is titled Color Design for the Color Vision Impaired, by Bernhard Jenny & Nathaniel Vaughn Kelso. 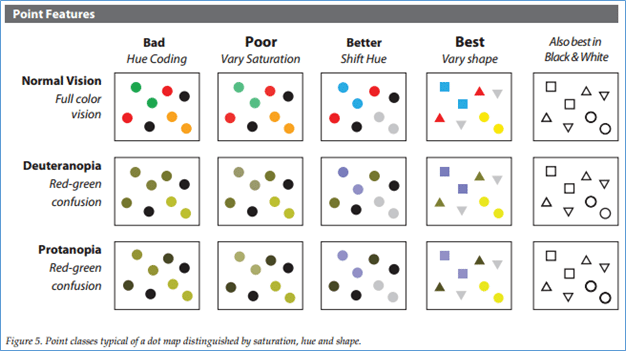 While one of the primary focuses of this paper is on map design and how cartographers need to be cognizant of color use in map design, it made me quite aware of how this topic affects many other lines of business. For example, a lot of work that we do at Syntelli Solutions is in data analytics and data visualization, where we create ‘pretty pictures’ using a variety of colors and charts/graphs to visually represent data for our clients. We typically create these visual analytics in platforms such as TIBCO Spotfire or Tableau Software. So, it is very possible that the adoption of a BI tool and analytics platform by one of our clients will be indicative of how well the visualizations are designed and how they are received by those consuming them. Can the data we’re visually representing in color be easily understood to glean strategic insights for a business? Some great examples of how to design data visualizations with this in mind are represented in the following screenshots from the aforementioned paper, hosted on Color Oracle. 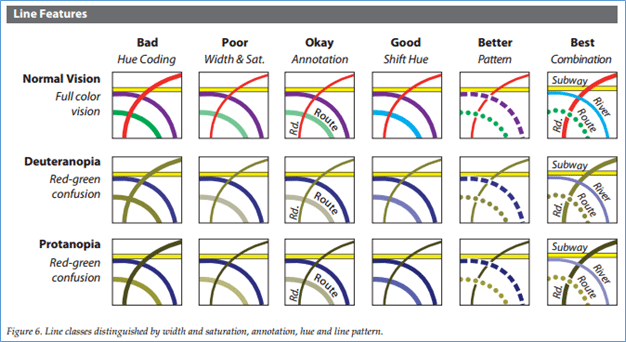 Figure 5 from the article shows how geometric shapes are one of the best ways to alter a point feature graphic so it can be easily understood by someone who cannot clearly differentiate between colors. In Figure 6, the same tactic can be applied on a graphic featuring lines to make it more universally understood without the need to see color clearly. Color Oracle actually offers a free color blindness simulator that allows you to see a visualization on your computer just as someone who is color impaired would so you can get a better idea of which colors/combinations may be better/worse to use. Another good resource for this topic is Vischeck. Now that I have a better understanding of the implications the use of color may have in data visualizations, it made me think about how we should be using color simulating software like this while creating our visual analytics in TIBCO Spotfire and Tableau Software so we can aim to make them universally understood.